Justin Bieber and Selena Gomez had a long history before the former decided to settle down with model Hailey Baldwin. There was a time when every Justin Bieber fan was convinced that the "Baby" singer will marry Selena Gomez. The couple was in an on-again-off-again relationship for a long time. However, in 2018, Justin finally moved on in his life and got married to Hailey Baldwin. According to InTouch Weekly via Stylecaster, even though Justin and Hailey aren't together anymore, it does not mean that she has allegedly lost all interest in Justin Bieber's well-being. 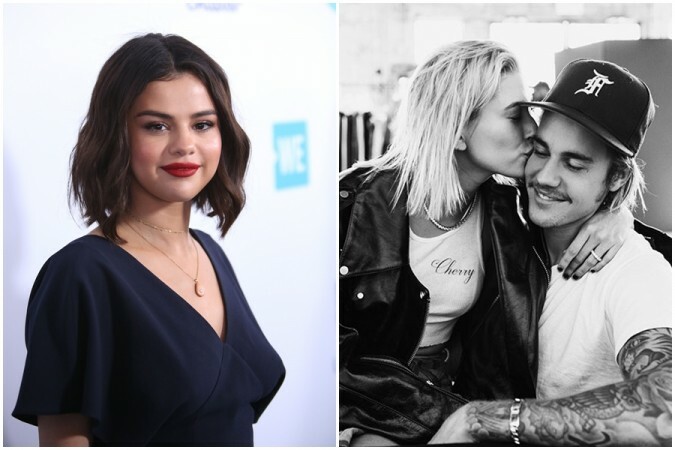 As per the alleged report, Selena Gomez had no problems with Justin Bieber getting married to Hailey Baldwin. An alleged insider revealed to the magazine that Selena has reportedly sent Justin "very loving messages of support." The insider further contends that Gomez is wishing Justing Bieber the best. As of now, the above claim is not verified by Selena Gomez's reps. It may be possible that the claims made by the alleged insider are nothing but yet another fabricated news. In addition to this, Selena Gomez fans are reportedly convinced that she has some new magic coming out very soon. Earlier this week, she shared a shot of four white robes hanging on a rack. Each robe has a name on the back — Selena, Blanco, Baldwin, and Tainy. Based on the names, they all belong to the music industry and now Gomez's fans are freaking out that the "Anxiety" singer is going to bring some new song in this year. Meanwhile, Justin Bieber and Hailey Baldwin secretly got married in a New York City courthouse in September 2018. As reported earlier, Justin is going to celebrate his 25th birthday very soon and is all ready to throw a big wedding in March. Recently, the newly married couple, who are enjoying their married life, opened up to Vogue about their marriage and how they both try to make it work. As per Hailey Baldwin, they are two young people who are learning as they are heading towards this blissful married life. She added that it's not all some magical fantasy and they know this that it is always going to be hard for them.